Michael D Higgins has refused to rule out the possibility of a second run for Áras an Uachtaráin. 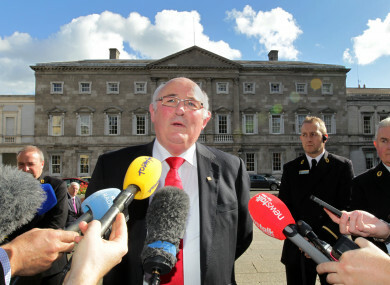 INDEPENDENT SENATOR GERARD Craughwell has said there must be an election for the position of president of Ireland – and that’s why he is throwing his hat in the ring for the job. Craughwell, who won a controversial Seanad by-election, beating Fine Gael’s reluctant candidate John McNulty, took to Twitter on Sunday night to say he was putting his name forward to ensure there is a contest when the election happens. A presidential election is due to be held in October 2018. However if no-one contests the election, current president Michael D Higgins could be given a free run at a second term. During the 2011 presidential election, Higgins repeatedly pledged that he would only stand for a single seven-year term. However since being elected, the president has refused to rule out the possibility of a second run for Áras an Uachtaráin. Last month, Taoiseach Leo Varadkar hinted that he would back Higgins for a second term. “The thing we don’t know yet, is whether President Higgins is going to renominate himself,” Varadkar said. Gerard Craughwell told TheJournal.ie that after reading journalist Elaine Byrne’s article in the Sunday Business Post, which was critical of Higgins’ possible row-back on his commitment that he would only sit one term as president, he was compelled to put his name forward. “I am putting my name forward to ensure there is an election. Michael D Higgins gave his word when he was a candidate for president that he would only sit one term,” he said, adding the president should be elected and not decided by political parties. He claims political parties, such as Fine Gael and Fianna Fáil, do not want a presidential election next year as they are too focused on the possibility of a general election. “The cost of two elections in one year would be significant. I think they are under pressure and are happy for Higgins to continue in the role as it will give them breathing space for a general election,” he said. Craughwell, who is a former president of the Teachers’ Union of Ireland (TUI), said Higgins made a commitment to the people of Ireland when he was elected that he would only serve one term and that he shouldn’t break his promise. “Frankly, that would be wrong. He should keep his word,” he added. The senator said he has nothing personal against Higgins. “He has been an outstanding president, but as far as I am concerned there has to be an election,” he said. So, is he a serious candidate for the job? If I am forced into seeking a nomination, I would become a very serious candidate… I would give 100% to it. “It is not something I would do willy-nilly, or for the hell of it,” he said, adding that he would travel to every corner of the country to secure votes. However, Craughwell told TheJournal.ie that he has not spoken to any TDs, senators or county councils about seeking a nomination. For someone to be nominated to run for the office of president, they must secure backing from at least 20 members of the Dáil and the Seanad or from at least four local authorities. When asked what policies he would run on, Craughwell said it is not the role of the president to have policies. “I am not going to solve the housing crisis or the trolley crisis,” he said, pointing out that the president is a representative symbol of a nation when abroad. Though Craughwell said he might be the first name put forward, he expects there to be other high-profile names announced before the year is out. Email “'Running for president of Ireland is not something I would do willy-nilly, but we need a contest'”. Feedback on “'Running for president of Ireland is not something I would do willy-nilly, but we need a contest'”.